Union Public Service Commission will conduct Civil Services Main Exam from 03 December. e-Admit cards for the same has been uploaded at the online portal of the Commission. Unlike previous years, the Commission has not issued paper admit cards to individual candidates. Candidates are suggested to take a printout of the e-version and produce the same at the allotted venue. UPSC IAS Main exam will be held at 23 exam centres till 09 December. The Commission has also directed candidates to carry photographs (identical to that uploaded during registration) and photo identity proof. Photo ID proof includes Aadhaar Card, Voter Identity Card, Driving License, Passport, etc. Candidates are suggested to preserve the print copy of the admit card till the declaration of the result. About UPSC Civil Services Exam: UPSC conducts Civil Services exam every year, in order to select eligible candidates for recruitment to top bureaucrat posts of the country. 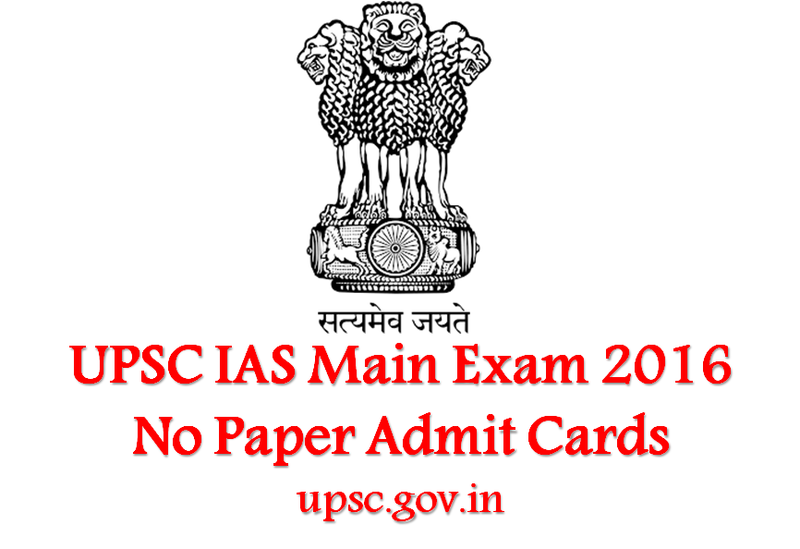 This year the UPSC IAS Main exam will held from 03 December till 09 December. The first paper on 03 December will be Essay (forenoon session). The second session on the same day won’t be having any paper. General Studies 1 & 2 will be held on 05 December and GS 3 & 4 will be held on the next day. The last day will be for Optional Papers (1 &2). Examination for Language papers will be held on 07 December. Indian Language (Assamese/ Bengali/ Bodo/ Dogri/ Gujarati/ Hindi/ Kannada/ Kashmiri/ Konkani/ Maithili/ Malayalam/ Manipuri/ Marathi/ Nepali/ Oriya/ Punjabi/ Sanskrit/ Santhali/ Sindhi (Devanagari/ Arabic Script)/ Tamil/ Telugu/ Urdu) will be held on forenoon session.